What good is to travel? When I first started writing this blog (2 years already! can’t believe it), my main objective was to build a traveling blog. I’d been following a couple of travel blogs (Barcelona Blonde, Nomadic Matt, and others) that had been fueling my desire for traveling the world and writing about it. But Money and other personal issues made me put a halt to these intentions, settle in one place, and start blogging about something else. I regret nothing. Thanks to this change in plans, I started writing fiction and blogging about it. What a memorable experience it has been. But I still travel. I may not be able to sail the world, visit all its continents, and be “on the move” constantly, but I’ve managed to travel quite a bit (18 countries, 44 cities, until now). My travel bucket list ranks high in my life priorities. And since there are some continents that I’ve never been too yet (Asia, Africa, and Oceania – Australia! why are you so far? ), my eagerness remains intact. But I can’t complain. If I die tomorrow, I’ve done my fair share of traveling. I couldn’t be most thankful. 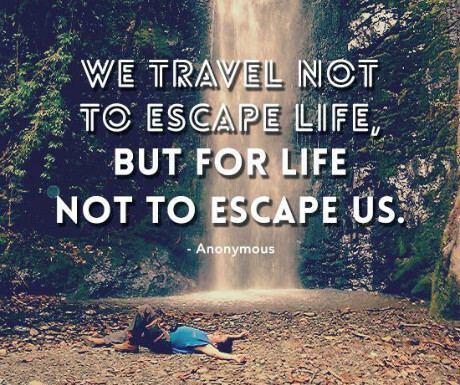 Traveling is a life-enriching experience, unmatchable to any other. And when you write, there’s nothing better to broaden your horizons. And though, I don’t travel as much as I did before, I still try to save as much as possible to do one nice trip per year. But what exactly have I learned from traveling? People are the same everywhere. They all struggle; they all do their best. Nobody anywhere is better than somebody elsewhere. There’s nothing better than learning other languages. Even if you don’t master them. It feels nice to say “hello” and “thanks” in many languages. It doesn’t matter if those are the only words you learn. People appreciate when you make an effort to learn at least tiny bits to communicate with them. Keep in mind that they’re in no obligation to know your language. Society restrictions are just that “society restrictions.” Those awful closed-minded standards by which your society apparently rules, end there, in that small circle of your town. When you travel, you realized that nothing of that matters, that you’re limited only by your own convictions. Globalization is here to stay. You can be whatever you want wherever you are. What other lessons do you think can be learned from traveling? I’m so envious of you. I love travel, yet because of money, it just isn’t possible anymore. I’ve been out of my own country three times. I doubt I’ll ever get the chance again. I have seen most of my country and I can tell you that things differ from one region to the next. I hope you are able to continue your journeys.